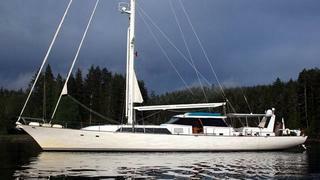 Brian Hermann at Ardell tells me there's a $350,000 price cut on the 31.7m sailing yacht Lochiel. She’s the well-known ex-Chanel, designed by William Garden and built by Alloy Yachts in 1985. In addition to seakindliness, she offers an enormous on-deck pilothouse and outside lounge areas. Belowdecks, Lochiel has three staterooms plus an office for owner/guests, a raised saloon, galley and crew quarters forward. The stand-up, walk-in engine room is a real advantage for a sailing yacht, and she has twin Volvo TMD121C 360hp engines. In addition, she has two generators and a 3,200-gallon fuel capacity. Her current owners bought her for a five-year journey around the globe. While a great platform to begin with, along the way they improved the efficiency of some systems, upgraded others, and maintained her well, culminating with a refit at the Delta yard in Seattle in 2010. Lochiel is down from $1,995,000 to $1,650,000.